CUTEST bridal shower balloons just added to our shop! 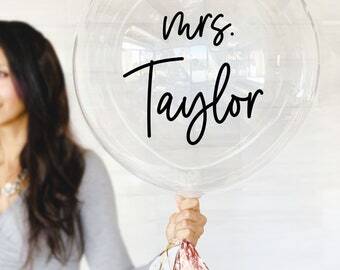 Personalized with the bride to be’s future last name - these balloons are sure to be insta-worthy! 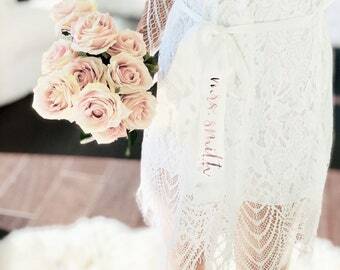 So excited about our NEW full lace bridal robes! Can you think of a cuter way to make the bride to be feel extra special while getting ready on her wedding day?! Robes come personalized with her future last name - perfect bridal shower gift idea!!! How is a girl to choose?! All the colors look like candy to me :). A perfect holiday gift for friends or bridesmaids! 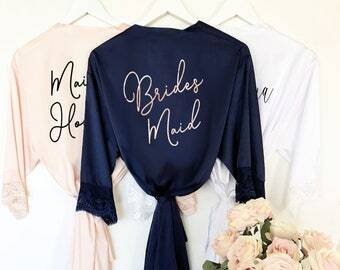 Last day to get 15% off these bridesmaid robes! 15% FLASH SALE on satin bridesmaid robes this weekend only!!!! While supplies last! Talk about bling!! 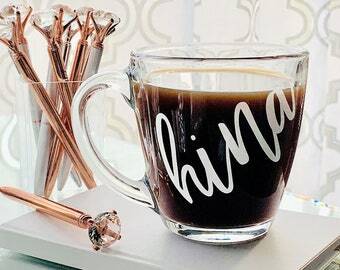 These diamond pens make the cutest bachelorette party favors ! How lovely does rose gold look in black, white or blush?! Love how these turned out for a special customer! Shirt Sale ends this Sunday - don't miss out! 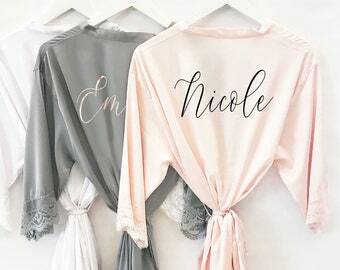 Excited to share the latest addition MOD PARTY - Personalized Bridesmaid Robes with Names! Ooh La La! 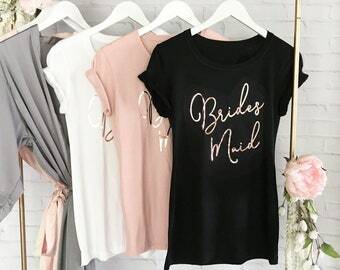 Bride and bridesmaid shirts & tank top sale - until Sunday only! While supplies last! Engagement season is almost here - brides to be will be springing up everywhere! A pretty "bride" glass makes the perfect gift for your newly engaged friend. Last day to take advantage of our 10% off unique items! Includes gifts from our newest collection of bridesmaid lip balms! SO many new things being added to the shop this week but one all you brides to be MUST have are our new bride veils!!!! OMG I've been married 20 years but still had to prance around in one of these all day yesterday! NEW! Bridesmaid gift bags for robes just added to our shop! If you're heading to the beach with you're bridesmaids you'll love our new "Good Times and Tan Lines" tote bags - just added! Hi darlings! How cute are our "cheers" bachelorette party cups?! I just had to make myself a drink in one! Intro offer 10% off! FLASH SALE - 15% off our new shirts! Ends this FRIDAY! So excited about our new Bridesmaid shirts! Get them in a metallic print to really stand out! Have you seen our monogram robe sale?! Lowest price EVER - this week only! While supplies last! Bath bomb favors on sale this week! Perfect favors for a bridal shower or spa themed birthday party! Pretty soaps just in - They make the most practical favors - finally wedding favors guests can actually use! A pretty pearl bracelet for a pretty bridesmaid - just added to our shop! Introductory sale 20% off only until Sunday! Don't forget the little flower girl in your bridal party! We just added these adorable little personalized bears - they look so cute ticked inside a gift box! Perfect for a flower girl proposal. Last chance to order Mother's Day gifts in time! Special! 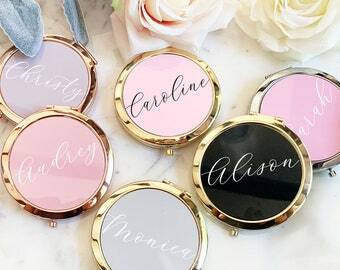 we are waiving the rush fee on our mom ring dishes and sending priority mail to arrive before Mother's Day - get these ring dishes ordered by midnight tomorrow! Offer expires May 8 at midnight! Graduation season is here...do you have a gift ready for the grad in your life??? Our personalized graduation candles make the perfect gift! NEW bridesmaid proposal gift box sets just added! These complete gift sets make it easy to ask a bridesmaid (or thank her!) by adding her personalized name and message to the box lids....intro price available for a short time only!! !